Hide deals from seller "East N West Fast Food"
Hide deals from category "Halal"
Limit 1 per person and 1 per table. Valid on 2 chicken burger sandwiches. Must order both sandwiches in same visit. New customers only. Promotional value expires 365 days after purchase. 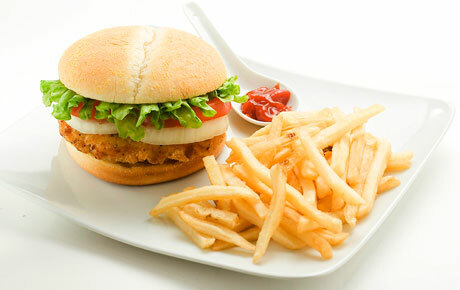 Take a friend out for a delicious meal with 30% off two chicken burger sandwiches from East N West Fast Food in Oakbrook Terrace ($10 value). These sandwiches are made fresh and come with all the fixings for a hearty and savory meal. With more than 200 years of family food expertise passed down through generations, the Ali brothers decided to open East N West to offer unique and affordable cuisine. They offer zabiha halal foods like burgers, onion rings, gyros, hot dogs and more. The Ali brothers boast a genuine passion for food, and they strive to achieve the highest customer satisfaction possible. Stop by this friendly eatery with a pal and savor their popular chicken burgers today. A restaurant in Oakbrook Terrace that uses Halal meat and offers gyros, chicken, burgers and more.